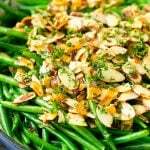 This recipe for green beans almondine is tender green beans cooked with butter and shallots, then topped with crunchy toasted almonds and parsley. A simple yet elegant side dish that pairs perfectly with chicken, beef and pork. You can never go wrong with a green veggie to accompany any meal. Some of my favorite vegetable sides include parmesan roasted broccoli, bacon roasted brussels sprouts, and this easy green beans almondine. We eat a lot of green beans in my house – they’re inexpensive, available all year round, and totally delicious. 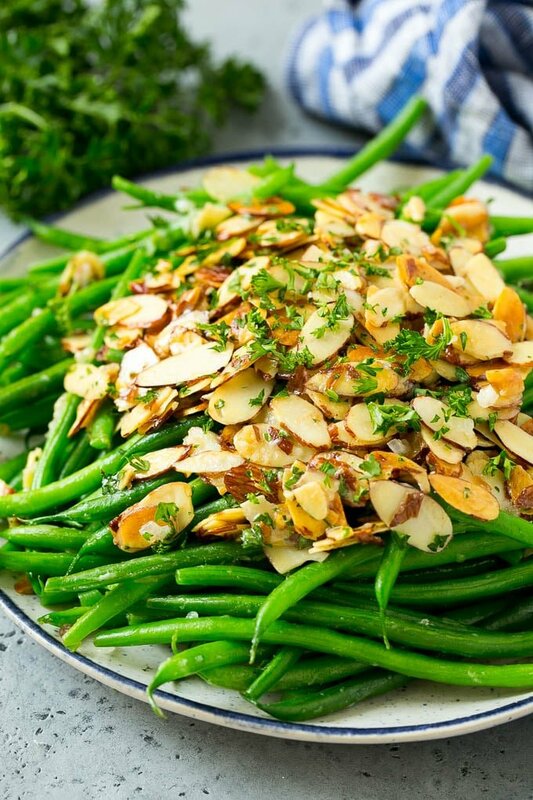 This recipe for green beans almondine features fresh green beans with a buttery almond topping – one of my all-time favorite ways to enjoy green beans! To get your green beans ready for this recipe, all you need to do is give them a good wash, then trim off the stem end. The fastest way to trim off the stem end is to line up a handful of green beans, then cut the stems off all at once. It makes prep time go much faster. The first step is to toast your almonds in melted butter. 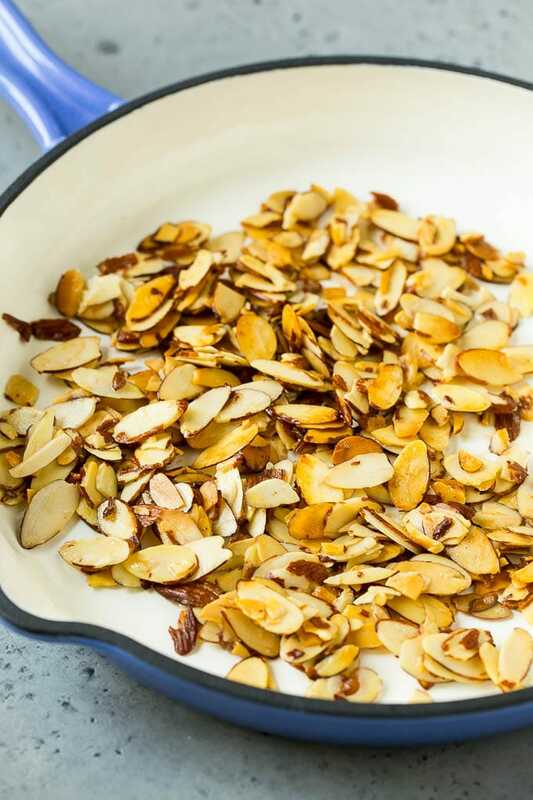 I use sliced almonds, but chopped or slivered almonds will also work perfectly. After the almonds are toasted, they come out of the pan and shallots, butter and green beans go in. The green beans cook until tender, then the buttered almonds are added back in along with some chopped parsley and lemon juice. 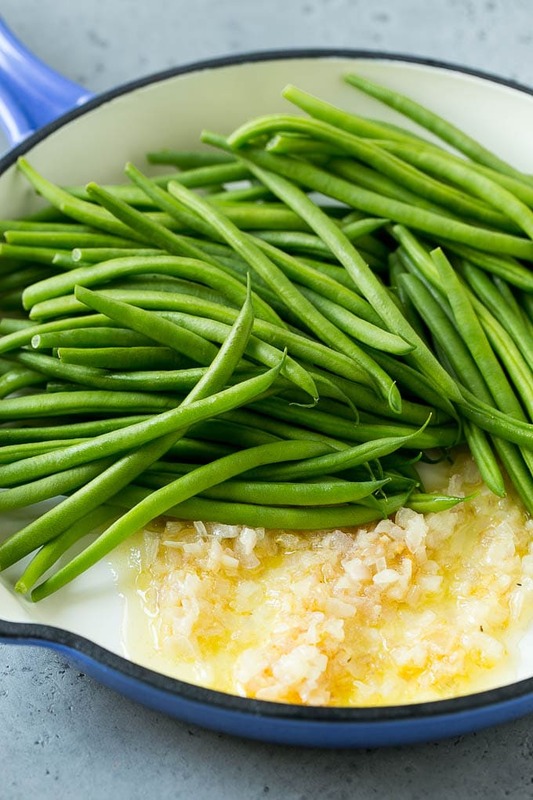 I prefer to use the smaller, French haricot vert green beans for this dish. They often come pre-packaged in bags in the produce area. If you can’t find haricot vert green beans, regular sized green beans will also do the trick. Shallots are a type of onion, and they taste like a cross between onions and garlic. If you don’t have shallots on hand, you can simply use either minced garlic or minced onion instead. I typically top this dish with fresh parsley because I always have it on hand. If you don’t have parsley, feel free to use green onions, chives, or even fresh dill or basil. Green beans are a very healthy vegetable and are packed with nutrients such as Vitamin A, C and K, potassium, iron, and calcium. 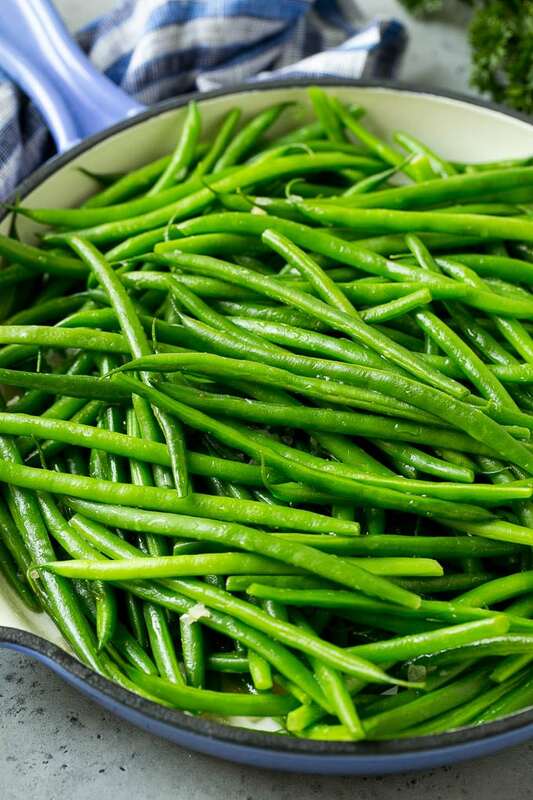 Green beans are also low in calories, low sodium, low carb and high in fiber. I love this dish as-is, but sometimes I add other ingredients I have on hand to give my green beans even more flavor. Bacon: Stir in 1/3 cup cooked, crumbled bacon at the end. Mushrooms: Saute sliced mushrooms along with the shallots before you add in the green beans. Parmesan: Sprinkle parmesan cheese over the top right before serving. Breadcrumbs: Add 1/4 cup Italian or panko style breadcrumbs when you toast the almonds. I love this recipe because it pairs well with so many different foods. I often serve my green beans alongside roasted chicken, seared steak or baked salmon. This recipe can be easily doubled or even tripled if you’re looking to feed a crowd. This is also a perfect side to any holiday meal, skip the green bean casserole and serve green beans almondine for a lighter and fresher option! Add the almonds to the pan and cook for 3-4 minutes or until golden brown, stirring occasionally. Remove the almonds from the pan; wipe the pan clean with a paper towel. Melt the remaining 2 tablespoons of butter in the pan. Add the shallots and cook for 3-4 minutes or until tender. Add the green beans and 1 tablespoon of water to the pan. Cook, stirring occasionally, until green beans are tender, about 4-5 minutes. Stir in the lemon juice, salt and pepper. 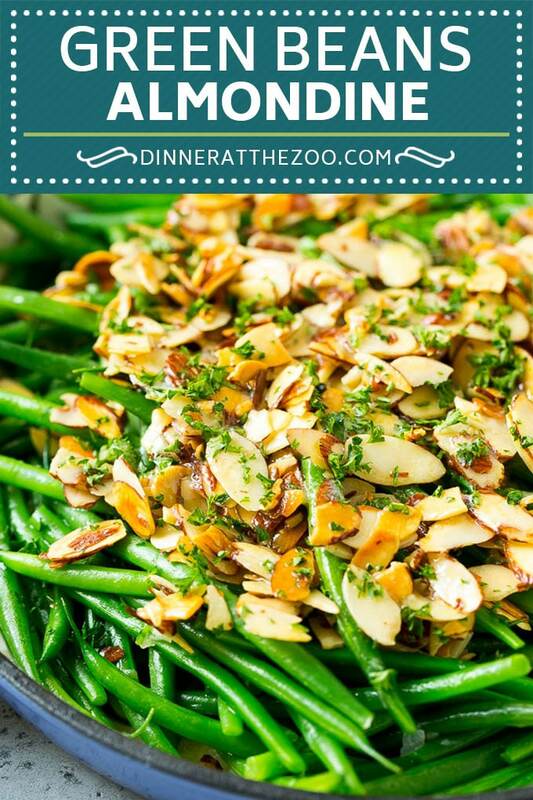 Sprinkle the reserved almonds over the green beans, along with the parsley. Serve immediately. Oh my! I was just telling my husband that I was craving green beans. And I bought some at the store yesterday! I’ll have to give this a try tonight. Look delicious! 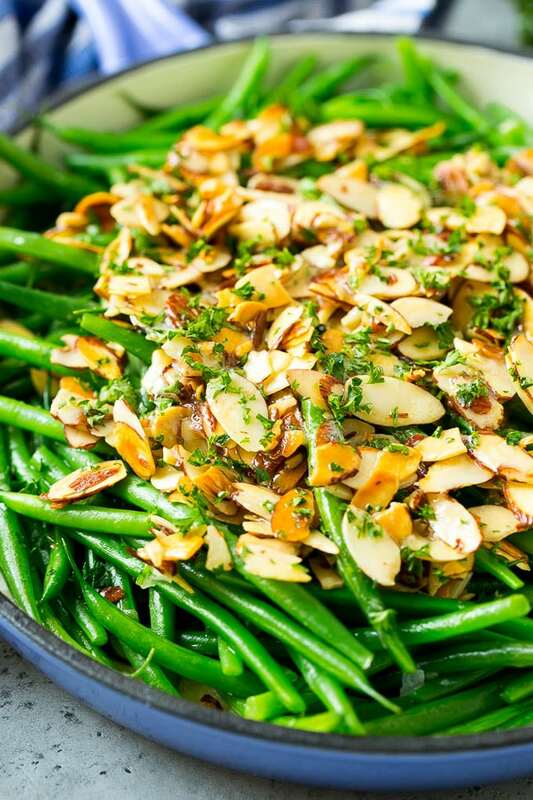 The almond topping looks marvelous over your green beans. I can’t wait to give this a try next time! Thank you for the little trivia in how the green beans is good for you and all the nutrients from them. I’ll definitely try that recipe for sure! I love the look of this dish, and always make veggies when eating a meal. Great use of almonds too! I have never had this before. I’d love to try it. I am making these tonight! 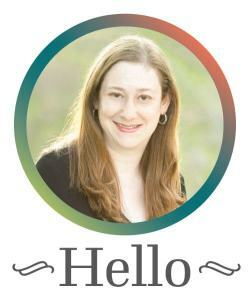 I have everything on hand, and I know my family will love them. I’ve never had Green Beans Almondine before. I would love to try it. It looks super tasty. This looks delicious, those beans just look so green and fresh and I love almonds in pretty much everything! I have to try this! It sure looks delicious! I’m used to making the ever popular green bean casserole! I can’t wait to try this out! All I can say that this recipe is one of my favorite not just it’s really delicious but it’s also a healthy one. I love this kind of food recipe wherein it doesn’t lack the health benefits we can acquire. This dish is making me really hungry! My family loves green beans in all forms. They might really enjoy this! Green beans are one of my favourite vegetables, so I am definitely going to love this recipe! I am so making this! I love it because it’s both flavorful and healthy. The veggies and that healthy fat are excellent! I have recently started to eat green beans again, and actually like them. I think your recipe is fantastic, with both flavour and texture. I would love to try it out.